Explore as ruínas de Herculano com um guia privado e veja os restos fossilizados da vida pré-AD79 quando o Monte Vesúvio expeliu a destruição sobre a cidade provincial. 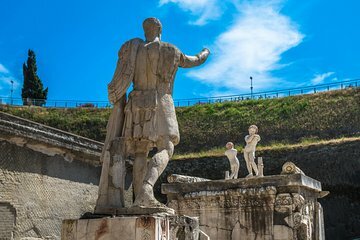 Aprenda sobre a infame erupção, que também alegou Pompeia como uma vítima, e passeie entre os balneários e lojas de Herculano - locais que sugerem a vida cotidiana nos dias da Roma antiga. A taxa de entrada e transporte de trem de Nápoles é pagável no dia. Com esta excursão, encontre seu guia em Nápoles e tenha uma visão geral da história de Herculano na viagem até lá. We did this as a shore excursion from our cruise. We were met at the pier by a super nice guide and then proceeded on a very long march around Naples. First to a ticket booth were we got subway tickets, then to a subway stop, on to the train station and then a run through the station to catch a train that was late and not at the station!! Once near Herculaneum we had a nearly one mile downhill walk to the site on uneven sidewalks and lots of traffic! All we could think of was the walk back!!! My husband was so tired by the time we got to the visitors center and looked down at the ruins and all the trudging around he'd have to do that he decided just to wait at the entrance. I want to stress that our guide was terrific! In no way was this lousy tour his fault, it is set up for extremely young and fit people! The travel time eclipsed the actual time at the ruins. In the end, we had our guide hire us a van taxi to take us back to the port. Not one of us wanted to repeat the long walk uphill, train, subway or walk through mad traffic to get back. BEWARE! Started off bad from the start. Guide was not at the appointed spot at the appointed time. Telephone contact numbers for Viator and tour agency were inoperative, without response. Guide showed up about half hour late when we were about to leave. Her knowledge was OK, but I don't think she had a scholastic background in the subject, and her English was marginal. She even smoked on the tour. The site was outstanding, but the guide was disappointing. Guide had different meetings location at train station that we had from Viator (not her fault). Train from Naples to site was hot and overcrowded and nothing as described in the overview which tells you to "sit back and relax." 5 hour tour ended up being only 2 hours..what a rip off. Do not go! This was worth every cent for what we learned and saw! Our Guide was fantastic and we would highly recommend this tour - in some ways, you see more than in Pompeii! This was a fantastic trip. Our guide, Giuseppe D'Angel was wonderful. He made it very easy to find him, did all the local train arrangements and gave local explanations while walking to the site. He was a joy. I STRONGLY recommend this trip and even asking for Giuseppe! We had a lovely private tour with our guide, Hilary sorry if spelt wrong and she was incredibly knowledgeable. We loved Herculaneum and liked the fact that it wasn't a large area to walk around in. volé. En fin de compte nous ne sommes pas allé à Herculanum et somme retournés à notre hôtel. The four of us were met bang on time at the agreed place at the Cruise Terminal and taken by Metro and Train to the site. Our Guide Dr Lavinia De Rosa majored in Roman History and one of her tutors was an archaeological excavator at the site, so her knowledge was unsurpassed. More importantly she gave the history and detail in an easily understood way. We spent two hours or more exploring Herculaneum with her and without any doubt we saw and understood far more than we would have done on our own with a map and guide book. We have no hesitation in recommending this guide and her Tour organiser Leisure Italy. Francesca was wonderful! From guiding us through the intricacies of the bus, train and subway to a very informative tour of Herculaneum, she was a great guide. Well worth the time and money. Patricia was a marvelous guide full of knowledge yet flexible enough to meet our need to abbreviate the tour because of othe plans. Herculaneum is a more compact and somewhat more interesting version of Pompeii to which my wife and I have both been. The way in which this seaside town was inundated, first by mud then lava preserved many beautiful remains of a different era including petrified wood that you will not find in Pompeii. Four hours of delightful learning and a trail that allowed this diabetic 60 year old to negotiate without exhaustion.